With the failure of the No.4 Bergmann 1896 to attract military interest (which couldn’t have been too difficult to predict), Bergmann and Schmeisser realized that the straight blowback mechanism of the 1896 model pistol would never allow for a sufficiently powerful cartridge. The solution was to redesign the pistol to use a locked breech system, which would allow it to handle the higher pressure required for a military cartridge. This redesign came in 1897 with the No.5 pistol and cartridge. First, let’s look at the cartridge. It was called the 7.8mm Bergmann, although it actually used the exact same size bullet as the 7.63mm Mauser of the newly-available C96 Mauser pistol. 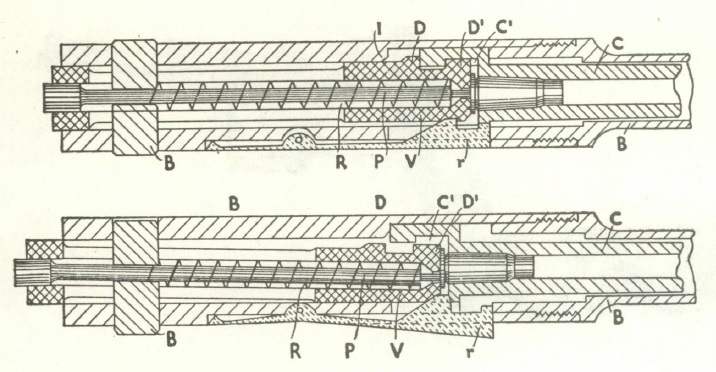 Like the Mauser round, the 7.8mm Bergmann was a bottlenecked cartridge. It propelled an 85 grain bullet at about 1300 fps (400 m/s) – very similar performance to the 7.63mm Mauser. The two rounds are very similar in appearance, although they can be distinguished by the longer neck of the Bergmann (this also prevents them from being interchangeable). The locking system designed for the 1897 Bergmann was one of the few ever made using a laterally-pivoting bolt (another is the Czech ZH-29 rifle). The bolt had a pair of 3mm deep locking lugs on the left side of the bolt, and a flat spring on the right side to keep them engaged in the matching cutouts in the side of the barrel extension. Upon firing, the bolt and barrel would remain locked together and move backwards about 6mm. At this point a camming surface on the rear locking lug would force the bolt to the right, unlocking it from the barrel extension. The barrel would then stop, and the bolt would travel the remaining distance back under inertia. The empty case would be ejected, a new round fed from the magazine, and the bolt would lock back up with the barrel extension and both would return to their fully forward position. 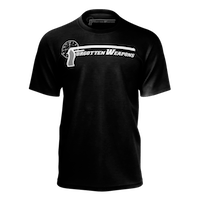 In other words, it was a standard short-recoil mechanism, with the detail of the bolt moving laterally to lock, instead of the more typical vertical movement. The magazine was also redesigned in the 1897 model Bergmann, with the 5-round Mannlicher-type clip finally replaced by a conventional double-stack, double-feed box magazine. The standard magazine would hold ten cartridges (although other capacities are sometimes found), and was provided with a set of witness holes on each side so the shooter could see how many rounds were remaining. Of course, the magazine well would cover these holes, so matching sets were drilled in both sides of the magwell. The magazine could be reloaded via stripper clip while in the pistol, or exchanged for a second pre-loaded magazine. The Bergmann 1897 pattern was tested by at least two nations for military use – Switzerland and England. The Swiss did their testing informally in 1897 and 1898, and appear to have found the gun too fragile or temperamental for service use. The British (who did not test it until 1902) thought the gun had potential, but they wanted a larger and heavier bullet weight than Bergmann could provide (something that would be equivalent to the .455 Webley round). Shoulder stocks were again offered with the 1897 No.5 pistols. While this was an option apparently seldom chosen by buyers of 1896 model guns, it was expected to be common enough on the 1897 that I believe all of them were made with stock mounting slots in the grips (such attachment slots were made specially on 1896 models only when the gun was to be sold with a stock). 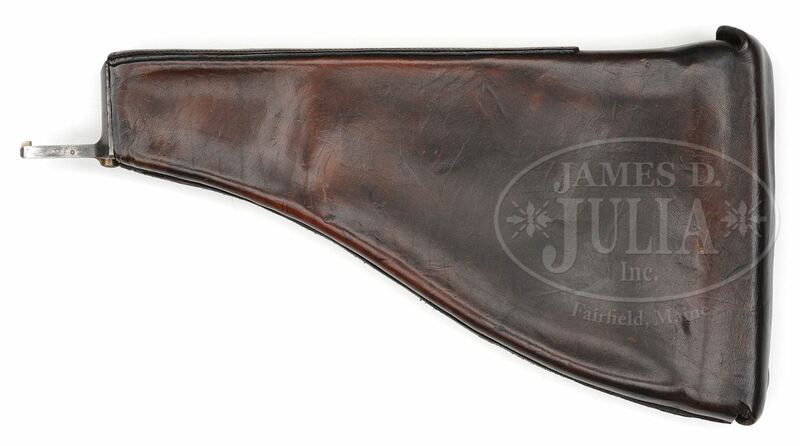 As was typical of the era, the shoulder stock doubled as a holster. One other new feature to the 1897 was a rear sight adjustable for range. Again like the other selfloading pistols of the day, the sight was calibrated out to a very optimistic 1000 meters (with additional markings at 100, 300, 500, 700, and 900 meters). The inside surface of the sight had machined notches matching these range markings, and a spring loaded button just ahead of the sight allowed it to be adjusted without slipping or moving when fired. 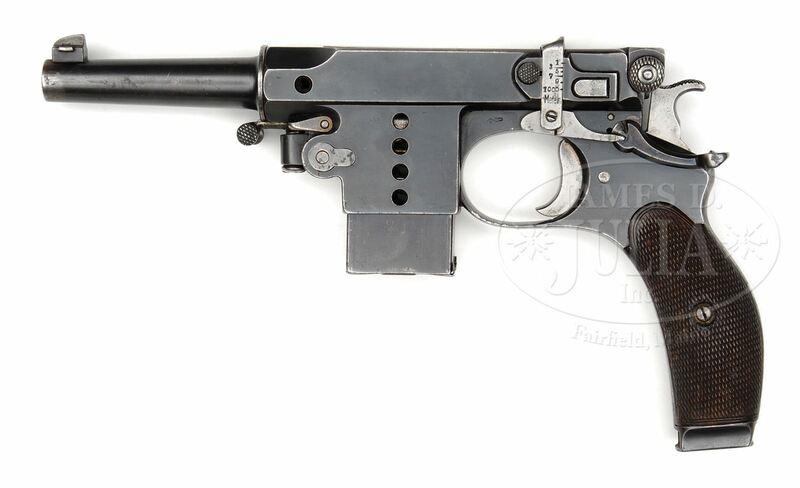 Elements that remained the same as the earlier 1896 and 1894 designs included the overall layout, disassembly process, simple single-action trigger mechanism, exposed hammer, sliding dust cover over the ejection port, and manual safety lever on the right rear of the frame. Sliding dust cover. This particular one is inscribed to Bergmann’s agent in Switzerland (photo from James Julia Inc). In all, about 800 No.5 Bergmann pistols were manufactured. They failed to attract any serious military interest, and most were sold on the commercial market. This pistol includes several feature distinct from the standard No.5 pistol. It has a full-length barrel shroud, and a tangent style rear sight (the actual tangent blade of which is missing). These are changes that are understandable from a Swiss military perspective, although the gun failed to win them over even with those elements. 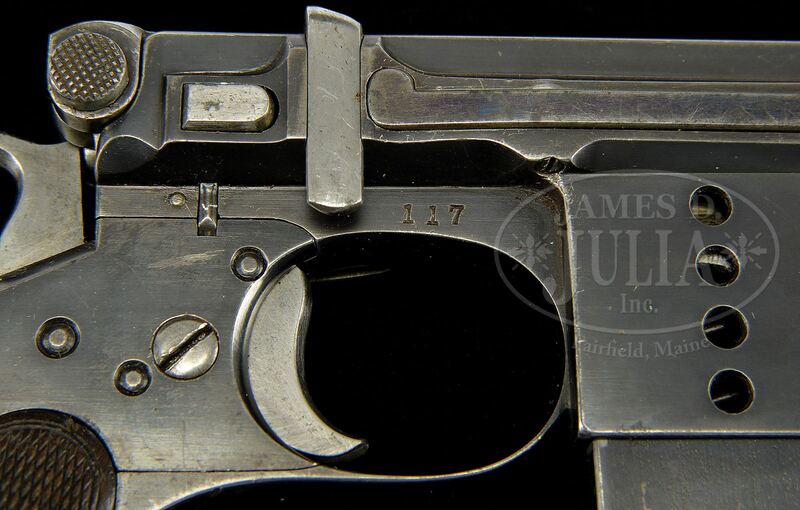 Second, we have photos from James Julia of a prototype No.5 pistol sold from the Sturgess collection. This one bears a lot of resemblance to the 1896 pattern, has no serial number, and appears to be an experimental transition model. Note pivoting bar on the upper receiver, which is spring loaded and acts to hold the bolt in its locked position. Note non-standard magazine (single stack) and lack of adjustable rear sight. *in Russia gun caliber mean barrel diameter measured between lands. Daweo, many thanks for the detailed data not found anywhere else. I assume that the Mauser C.96 was more popular than the Bergmann No.5 because the Bergmann looked more fiddly with its parts, even before dis-assembly. It seems a bit fragile for the battlefield and more likely to snag on undergrowth than the Mauser. The Mauser company was also well-known and trusted military firearms factory (for example: Mauser Zig-Zag revolver, Mauser 1871 rifle), when the Bergmann was newcomer in firearms market. It is easier to depend on well-know manufacturer gun, that in newcomer factory, despite the true pros and cons of particular gun. 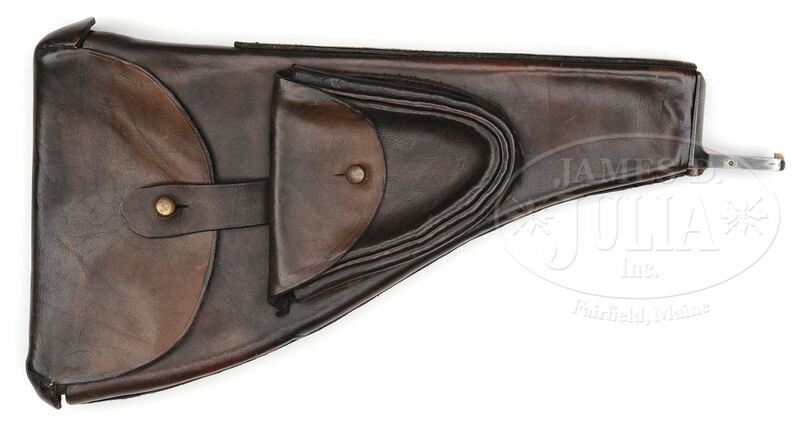 Regarding the holster/stock, there does not appear to be any belt loops or hangers, etc., to fasten it to a belt. the counter lock surfaces got worn and bevelled. Good point strongarm. You really have to wonder what took it to the next step in form of Bergmann-Bayard. That type of lock lived well till Lahti and recently in upside-down form in russo-italian Strizh. I consider them to be construction differences, not principal ones. They all represent a group of solutions which are alternative to pervasive barrel tilt of Browning’s approach. Not to get into major contest, the straight slide barrel is IMO the better way, although it needs one more part. Again, I grow little curious why say HK and Walther dropped that concept in favour of latter one. They lost their uniqueness, for sure. an obeyant of Browning with introduction of Nano. Right, and Nano is also short range plinker where accuracy is not priority. There is always a time when cheap is the way to go on expense of something else. If I was to pick handgun from Beretta it would be .45cal Cougar with rotary action. What about Schwarzlose 1898 rotating bolt semiauto pistol? It is more or less accurate than rotating barrel design? It is cheaper or more expensive than rotating barrel design? Tell you truth: have not seen this pistol before. 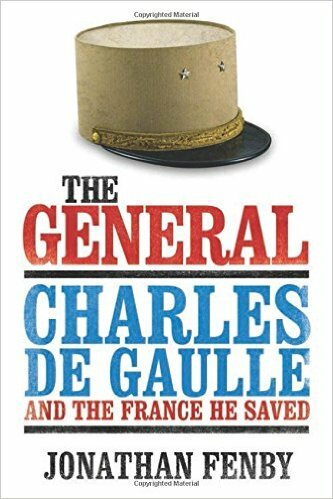 Just giving it cursory look and reading in Gunwriters about it – I am impressed. It does not look (in my short memory) that this well thought out and efficient design was ever duplicated in more modern form. The thing against these ‘antique’ pistols is that they contain large amount od machining. Novadays with plastic frames and minimalist slides they would hardly be able compete. But what makes them so enticing is their ingenuity. Today’s scene is quite flat in comparison. Is the ZH29 side locking ? I thought the rear of the bolt cammed up rather like the Bren but I could be wrong, long time since I fired one. models outclassed the concepts in which the Schwarzose 1898 kinds made.